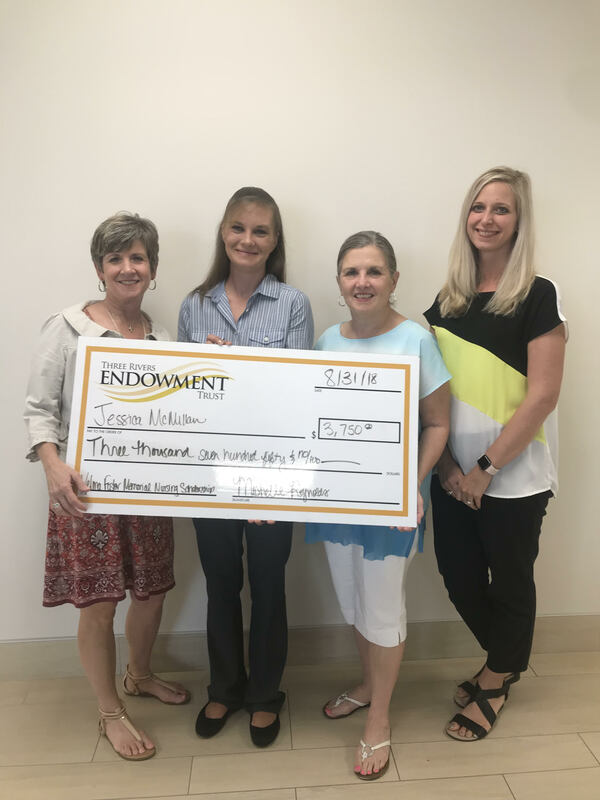 Jessica McMillan of Bloomfield has been awarded the Velma Foster Memorial Nursing Scholarship by the Three Rivers Endowment Trust. The scholarship, which provides financial assistance for the five semesters McMillan expects to attend Three Rivers College to complete her nursing degree, was set up by Tammy Stocks and Stacy Wood, the daughters of Velma Foster, who died in December 2017. McMillan is a 2000 graduate of Puxico High School. She is married to Toby McMillan. Foster was a nontraditional student who graduated with her associate degree from Three Rivers in 1981 – the same year one daughter graduated college and the other high school. Mrs. Foster went on to receive her BSN and MSN degrees from Southeast Missouri State University. She worked in a variety of roles until she was hired at the John J. Pershing VA Medical Center in Poplar Bluff, where she worked for more than 20 years in outpatient mental health before she retired.